The yearbook of Hephaistos is a useful, and praiseworthy annual project of photographically documenting the work of several different master blacksmiths from around the world. Each annual has a brief biography of the smiths and a large number of beautiful photographs of their work. Each annual, in fact, contains hundreds of high-quality photos. The 2003 yearbook of Hephaistos cover works and biographies of 9 outstanding European metal artists with German with English translations. Peter Elgass opens with a commentary about modern design pirates patenting the ideas of others. 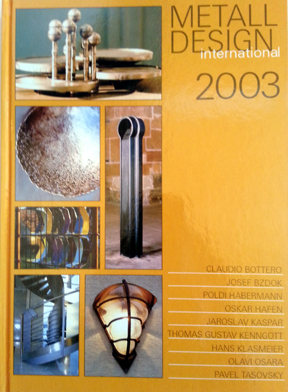 Italian, Claudio Bottero's original ideas and techniques with iron are presented in the annual. Claudio demonstrated stretching and upsetting techniques in bowls and sculptures after an interesting technique of first cutting patterns into plate.